Cornwall has a rich archaeological heritage with sites identified from as distant as the Paleolithic Era (Old Stone Age) of pre 8000BC. Axeheads from this period have been found in Cornwall evidencing the presence here of the earliest hunter-gatherers. Mesolithic sites (Middle Stone Age) have been identified in Cornwall at Dozmary Pool on Bodmin Moor. Along many parts of the North Cornish Coast, flint working was prolific, notably at Trevose Head and at Land's End. Around 4500BC the Neolithic period (New Stone Age) began and it is from this period that the earliest monuments survive. The people of the Neolithic period had a knowledge of agriculture and constructed permanent settlements. Carn Brea is believed to date from this period. This settlement within a tor enclosure is sited on the summit of a very prominent rock strewn hill which commands excellent views over the surrounding countryside. 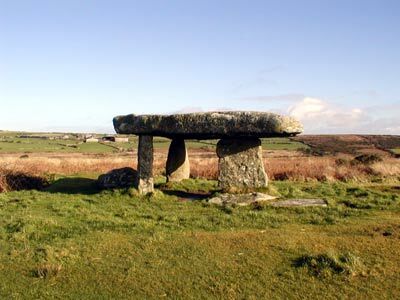 Chamber Tombs such as Lanyon Quoit on the Land's End peninsula and Trethevy Quoit at St Cleer in East Cornwall are just two of the numerous huge stone burial chambers characteristic of the Neolithic period which can be seen in Cornwall. Neolithic pottery, polished axeheads and leaf shaped arrowheads have been found dating from around 3900BC. The late Neolithic and Bronze Age saw the introduction of the constructing of stone circles, standing stones (menhirs) and stone alignments. 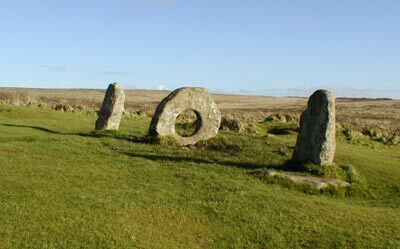 Monuments such as the Merry Maidens stone circle near Penzance, the Dry tree menhir on Goonhilly Downs and the Men an Tol (Cornish for holed stone) on the Land's End peninsula are examples of the many monuments which can be found right across Cornwall. The Iron Age is also well represented in Cornwall with courtyard house settlements at Chysauster and Carn Euny, both near Penzance. Hill forts, cliff castles, fogous, enclosed settlements, all characteristic of this period, are numerous throughout Cornwall. For a more complete picture of Cornwall's archaeology please see the list of archaeological sites below and any of the numerous publications on the archaeology of Cornwall. Some books may only be available for reference at the Cornwall Centre at Redruth.